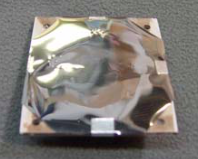 Antenna Development Corporation, Inc. (AntDevCo) has designed and developed X-band medium gain spacecraft microstrip patch antennas. These antennas are capable of supporting high data rates and up to an estimated 25 Watts of transmitted power. This single-band unit operates in the NASA Deep Space Network center frequency of about 8100 MHz – other, custom, center frequencies are available. The antennas options include LHCP, RHCP, or linear polarizations. All antennas include extensive testing data including principal plane radiation pattern plots, gain bounds plots, and coverage statistics.